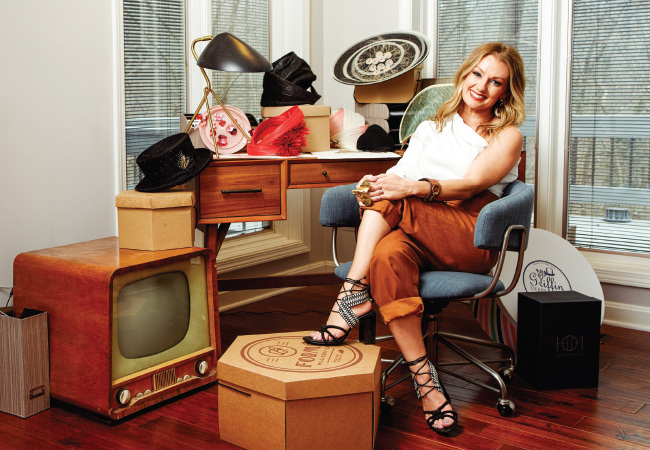 Her day job, as Director of Community Relations for Churchill Downs, may find her wearing fabulous fascinators, but this busy executive and mother of two boys wears many hats at work and home. She’s no stranger to crazy hours and unpredictable days. 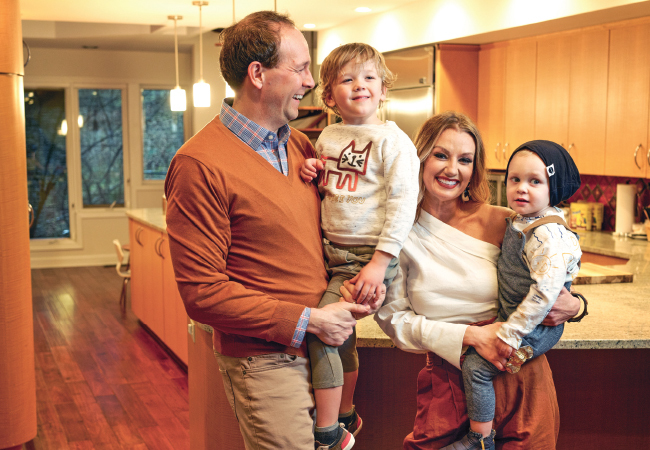 Having spent seven years as an editor at local lifestyle publications—first as the fashion editor of the now-defunct N Focus and later as the editor of The Voice-Tribune, Tonya Abeln juggled a full schedule of deadlines, interviews, social demands and fashion shoots before having her first son, Luke, in 2013. Five years later, she is settled into a new role as Director of Community Relations at Churchill Downs, where her juggling skills continue to come into play—especially during the next few weeks. She approaches the demands at home and work with optimism, kindness and a sense of humor… which she shares with us in a quick pre-Derby interview. I have been married for 15 years to my husband, Kris Abeln who I met one summer in high school when we were both Governor’s Scholars representatives from our schools. We have two sons: Luke, age 5 and Todd age 2. In my role at Churchill Downs, I get to partner with nonprofit organizations that are doing incredible things to impact our community in a positive way. It is extremely rewarding to align with those change agents either by way of contributions or creating opportunities for them to fundraise and share their mission at the racetrack. Then, of course, there is the wonder of getting to be a part of the magic of the Kentucky Derby. Through Churchill Downs Foundation, I am able to identify ways that we can support the often-unsung heroes of the industry—thoroughbred aftercare, injured jockeys, services for backside workers and resources for the neighborhoods surrounding the racetrack—without whom none of this great tradition would exist. Quite simply, I don’t. I think the sooner women admit that to each other and set the reasonable expectations that there are going to be large chunks of time when you feel like you are spiraling completely out of control, the less opportunity there is for feelings of isolation or failure. A wise friend once told me, “Balance is for ballerinas,” and I’ve always considered myself more of a tap dancer anyway. So, if I’m sticking to that metaphor, I think often my rhythm doesn’t make sense to everyone around me, but I’m endlessly eager to put on a good show and am almost always out of breath at the end of the routine. I think many of us take on too much with the best of intentions and there is never enough time to do it all. I’ve tried to embrace the power of “no,” but it is against my nature and a real struggle for me. I know I’m not the only one who seems to be in a constant battle with communication. I can never stay caught up on emails, direct messages, text messages and phone calls. It is nearly debilitating because I always like to spend some thoughtful time with my responses (I also do not possess the gift of brevity), but I also refuse to be on my phone during time with my children, so something has to take a hit. Usually it’s my wasteland of an inbox. Ultimately, you have to ask yourself, “What balls can I drop today?” I’ve learned to look for the ones that are seemingly made of rubber and will bounce right back the next day. But sometimes you see one that is made of glass and will shatter if dropped. Some days that one is your kids, or your marriage, or your friends, or a work project and some days that fragile ball is your health. You have to learn to identify those and tend to them. Give yourself permission to let the others go. I keep very odd hours. At the end of the work day, after I’ve put my boys to bed, I’m usually pretty zapped. If I’m lucky enough not to doze off telling a story in a toddler bed, sometimes I’ll try to do something for myself like walk on the treadmill while catching up on text messages, but, let’s be honest, mostly I zone out to meaningless television. I’m not advocating this as the best coping skill, but many days it is just what I need to turn my brain off for a bit. I call it passive productivity because often I am planning out the steps for the next days while the Housewives are throwing drinks at each other. I sleep for a few hours, then usually wake up at 3 or 4 a.m. to catch up on work or home. There is something empowering to me about having time to yourself when the world is still. For a few hours I can respond to emails without my inbox just filling up again. I did learn to schedule my messages to send at 8 a.m. so I don’t have to keep answering questions about why I’m awake in the middle of the night! Some mornings I’ll grab a quick nap again before my boys wake up. Mainly, and this is the most important one, I’ve learned to accept help graciously. If I ever appear to be pulling it off, it is because I stand on the shoulders of a wonderful support system; a husband who takes on a bulk of household duties, family who organize my home when I’m overwhelmed, friends who love my children and will watch them for me, a babysitter who steps in at a moment’s notice and co-workers who are completely understanding if I need a mom moment. They say it takes a village and some days I feel like I’m working with a small city. Could I do it without them all? I really don’t want to know. It would be at the risk of my sanity, I fear. HAVE YOU HAD ANY TURNING POINTS IN YOUR CAREER OR HOME LIFE THAT CAUSED YOU TO SHIFT PRIORITIES? I was in extreme denial at first that taking on a demanding job would alter my personal life. Suddenly, I found that I was a flight risk for just about everything I planned that was not work-related and it felt terrible to constantly cancel plans with people that I care about. I had to face a reality check that I’m not able to do the social things I used to enjoy at this stage of my life. It was painful for me to admit, but I can’t really do lunch, coffee or happy hours with my friends anymore. I have young children who need me for everything right now and a job that requires a lot of my time after traditional work hours. I do believe this is just a chapter in my life though, and I’m lucky to have friends who are very patient with me and are used to my disappearing acts when life gets intense. DO YOU SHARE ANY ASPECTS OF YOUR CAREER WITH YOUR CHILDREN OR DO YOU KEEP THEM COMPLETELY SEPARATE? I’m lucky that my husband and my boys really love the racetrack so I incorporate them as often as I can. They come to Family Adventure Days during racing season and Twilight Thursdays. My boys do not really understand what my job is, though. I noticed on a questionnaire at school once that my oldest was asked what his mother does and he responded, “She goes to the racetrack every day,” so I can only imagine what his teacher thinks my lifestyle might be. DO YOU THINK YOUR WORK ETHIC HAS RUBBED OFF ON YOUR CHILDREN? By looking at their messy rooms right now I would say no, but I’m working on it. I have recently regained a love for Pilates so I try to get out of the house two mornings a week before the kids wake up to indulge in that time to myself. I love live music, movies and theatre, but, of course, the frequency with which I get to enjoy them is less now that I’m a mom. Someday soon, I hope to incorporate the boys into those things I enjoy and nurture their love for it, too. I really enjoy fashion and luckily I’m able to incorporate that into my job somewhat since Derby week is so closely aligned with style. VALUES DO YOU TRY TO MODEL FOR YOUR CHILDREN? Nothing is more important than the way you treat people. I’ve always believed that there isn’t a person in this world that I can’t teach something to and there isn’t a person in this world that I can’t learn something from. Everyone is worthy of our time and respect. I hope they see that in me. That would make me immensely proud. I have nothing new to add to the narrative of motherhood. It turns out that everything you’ve always heard your entire life is true: It’s the hardest, most wonderful, challenging and satisfying, maddening yet exhilarating thing I’ve ever done. It is, without a doubt, my greatest accomplishment. But I don’t necessarily think you have to be a mother of humans to enjoy that sense of fulfillment, and I don’t want to perpetuate that motherhood is always what makes one’s life complete. I think relationships, pets, caring for aging parents—any time you care for something or someone else more than yourself and the currency with which you are paid is sometimes love, sometimes anger and sometimes total disregard—then you get the picture, and you should be proud. I was once editing a magazine cover where we featured a beautiful dancer, a ballerina, in fact, if we want to bring this full circle to “balance.” She was leaping in the image and I caught myself wondering if the photo had caught her on her way up or down. That moment made a lasting impression on me because it occurred to me that falling and flying are interchangeable. In terms my sons would understand I would reference “Toy Story” when Buzz thinks he’s flying but Woody declares he’s just falling with style. In the end, it doesn’t matter. On the inside, it may seem like you are stumbling, coming up short, dropping all the balls—you may feel like you are free falling. But to someone watching, they think you’re flying. Embrace that.